Yeah. That is what the event at Venky’s school was called. As I have recounted in my previous post, Venky was super duper excited. He brought home an invitation card (made by him) which said that our time slot was 11.00 am. So, on the day of the event, after bath and breakfast I dressed Venky into home clothes and asked him to kill some time with his neighborhood friend Tejas. Both boys ran around in and out of my house and that of our neighbor’s while I got ready. I asked my maid to iron my pants and suddenly there was a shriek. Venky and Tejas had somehow landed in the room where ironing was being done and Venky had touched the hot iron with a finger. Ice was brought out and damage was inspected , which was not much. But Venky was howling. With only 20 minutes left to start for school, I was now in a fix. I asked Venky to keep his hand dipped in a bowl of cold water. After 10 minutes he said he was fine. So, I started to get Venky change into his uniform. And there he was, howling again “My finger is burning! I don’t want to go to school”. Since Venky was so looking forward to this day, I really did not want to ditch this event. But time was running out. The burning sensation returned everytime Venky took his hand out of the water. Eureka! I put some chilled water in Venky’s water bottle and asked him to keep his hand dipped into it while I drove him to the school. The event was running late and we had to wait for another half hour for our turn. So, Venky got some more time to keep his hand in water and by that time, the burning sensation died down. His teachers helped in lifting his spirits by giving him a star and offtering toffees. Then it was our turn into Venky’s classroom. 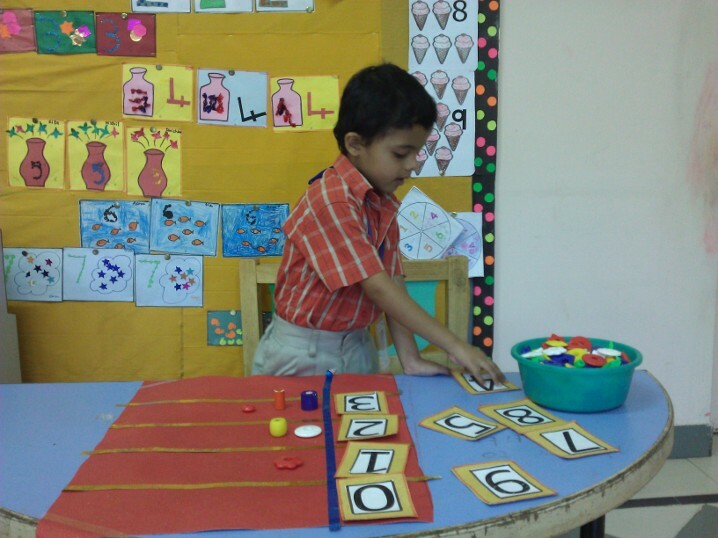 Venky explained all the counting and reading activities to me. Hopped on the reverse counting number ladder. Explained the callerpillar to butterfly and seed to tree lifecycle. Showed his portfolio. And finally gave me a “Thankyou for coming” hand print card. Categories: Events, Venky | Permalink.